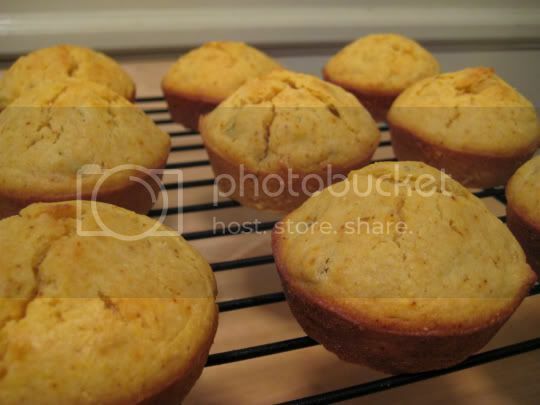 A perfect complement to soups, stews, or a nice bowl of chili, these Southwestern-flavored corn muffins are super easy to make and great tasting. This is basically your standard cornbread, but with onions, green chilies, and chili powder that add a pungent, spicy flavor. The cornbread is somewhat sweet, but it is the perfect balance of sweet, salty, and spicy. Each bite has the slight crunch of onions, which add a different (but good) kind of sweetness, and the spicy, tangy green chilies. I actually had these for breakfast, but these would go well with any meal at any time of the day. Leftover muffins were slightly dry (after being refrigerated), but still tasty enough to eat more than once. Make again? Yes, with chili next.